This document will walk you through posting advance deposits for reservations. When entering the reservation you can validate the guest's credit card, creating a "card on file" that you can process for the deposit. If there is a validation for this guest, you will see the sequence number beside the "validate card" button. In the example below, the sequence number is 000141. There is an optional MENUINI configuration setting that will allow you to set the deposit amount policy (such as first night or $200) and due date policy (such as 30 days prior to arrival). The deposit required amount will display on the Enter Advance Deposit screen. 1: From the reservations menu go to Reservation Operations and then Enter Advance Deposits. 2: After you save the reservation, click the Deposit button. The Enter Advance Deposit screen displays the guest name & address and the reservation confirmation number. A box on the upper right displays the date the reservation was entered, the arrival date, the departure date, the deposit required amount (if entered on the reservation), deposits received, and room rate. Below the guest information you will see the "credit card on file" if a credit card was validated when the reservation was entered into the system. If this information is not present, there is no card on file for this reservation. "Comment:" will be the guest name. Do not change this. "Charge/ payment type:" will populate automatically if there is a card on file for this reservation. If this is the case, simply press Enter. Do not type anything in this field. If there is not a card on file and you wish to process a credit card, type / on your keyboard and press Enter. This tells the system that you wish to process a credit card. For other payment types such as cash or check, simply type a valid payment code such as CA and press Enter. If you enter a credit card payment code, a popup asks "Process credit card". Answer Yes. When prompted, enter the dollar amount of the deposit in this format: 253.82 and press Enter. The minus sign will display when you post the payment and this is correct. Do not type the minus sign unless refunding the deposit. Press Enter at OK. The guarantee code will populate. DO not change it. Just press Enter. The main reservation screen will show the deposit received and date the deposit received. 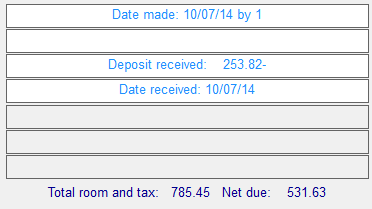 The "Deposit received" amount is the sum of all deposits for this reservation. To view the details, go back into the reservation and click the Display Deposits button. The deposit posts to the Advance Deposit Master Folio where it resides until the guest checks in. 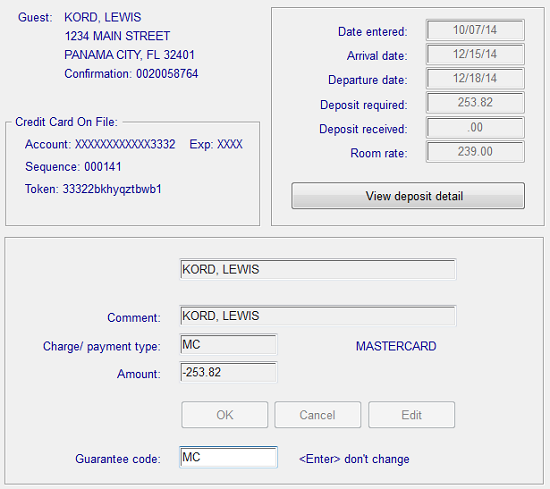 When you check in the guest, the deposit(s) automatically "transfer" to the guest folio. The transactions that are posted silently are debit to the advance deposit folio (offsetting the credit posted when the deposit was entered) and credit to the guest folio. The code that posts automatically is DEPU. On your payment journal you will see at least one debit and credit for DEPU and the sum should be zero. This is something that the auditor should check nightly when reviewing the payment journal. Group deposits: If the group's guest room & tax charges will post to a master folio, the deposit for the group should be posted to the group master folio, not to the individual reservations. You will go to Post Folio, enter the correct folio number for the group master, and post the deposit there. General Ledger: If you use Execu/Tech's Back Office or one of our accounting interfaces, you may maintain a separate "Advance Deposits" account rather than including advance deposits in the "Guest Ledger" GL account. Payment codes must be set up to designate advance deposit receipts from other receipts so that those payments will go to the correct GL account. The payment code MUST begin with the same letters as the other payment codes for this payment type. 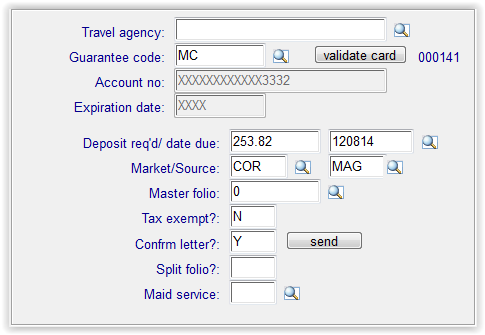 For example, if you have a hotel payment code VS you can set up a payment code VSD. It cannot be DVS. Typically a payment code will credit your GL guest ledger account and debit your GL bank account. Using the new advance deposit payment codes such as VSD, the credit would go to advance deposits in GL rather than to guest ledger. In addition to setting up the various payment codes such as VSD you should set up a payment code DEPU. DEPU will debit your advance deposits GL account and credit guest ledger when the guest checks in. Note that DEPU is separate from the payment code DEP. You never will use either of these codes; they are for internal use only. You will designate your general accounts in the Hotel payment code setup. Your accountant can advise you on the correct accounts to use if you do not know. The table below will give you a general idea of the GL accounts you need to designate.